Our overall goal for our late summer/early fall 2018 trip was the upper eastern part of the United States. We started off going straight north into Michigan where we spent time with cousins on both sides of Roy’s family. 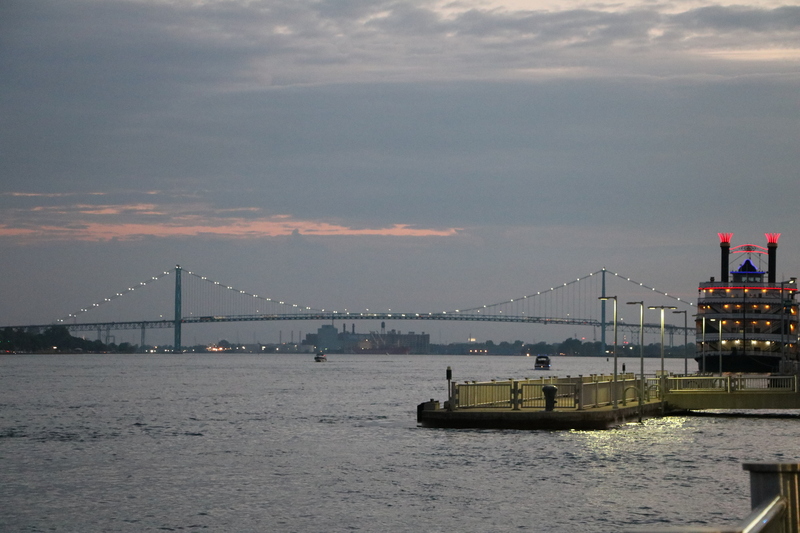 After that we planned to enter Canada from Port Huron, come into Ontario, and exit back in to see Upstate New York. First we spent a long weekend in Stockbridge with Beth, her husband John and their daughter Lisa. Then we spent a couple of days with Kathy who helped fill us in on some family history. Our goal after New York was Nova Scotia where Roy’s paternal grandparents were born and lived until they married and relocated to Detroit. Kathy’s town, Shelby Township, is very close to Detroit and she and her boyfriend Doug took us into the city. Roy’s grandpa left Halifax in 1923 and eventually wound up working in a Ford car factory. Roy’s grandma didn’t come until 1925 and almost immediately got a job at the now closed Herman Kiefer Hospital shown in the upper right corner above. She had been born in Prospect and later had come to Halifax where she met Roy’s grandfather – it must have been a huge culture shock to come to Detroit. 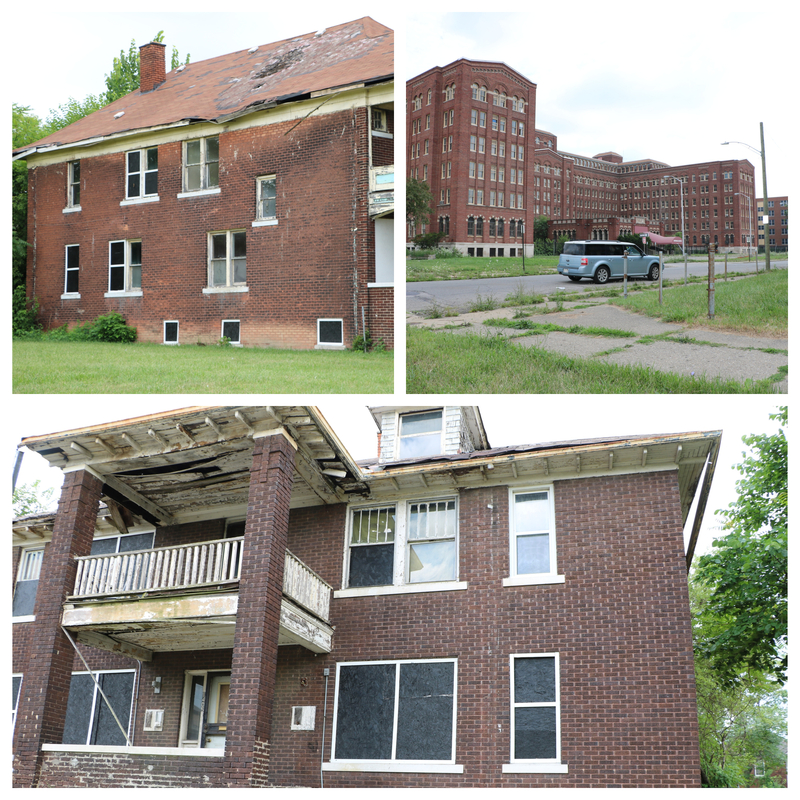 They lived in a rented house right across from the hospital on Taylor Street that is now a vacant lot shown in the upper left corner above. Sometime later they moved a block or so over on Clairmount to the house pictured immediately above and rented the half on the right. Both of their first homes were right by 12th Street, the site of the 1967 riots. They were gone long before that; in 1946 they bought there own home on Westbrook, down the street from Redford Township High School. Kathy and Doug drove us around downtown and we stopped at the Detroit International River Front where we had a great view of the Ambassador Bridge that connects Detroit to Windsor Canada. 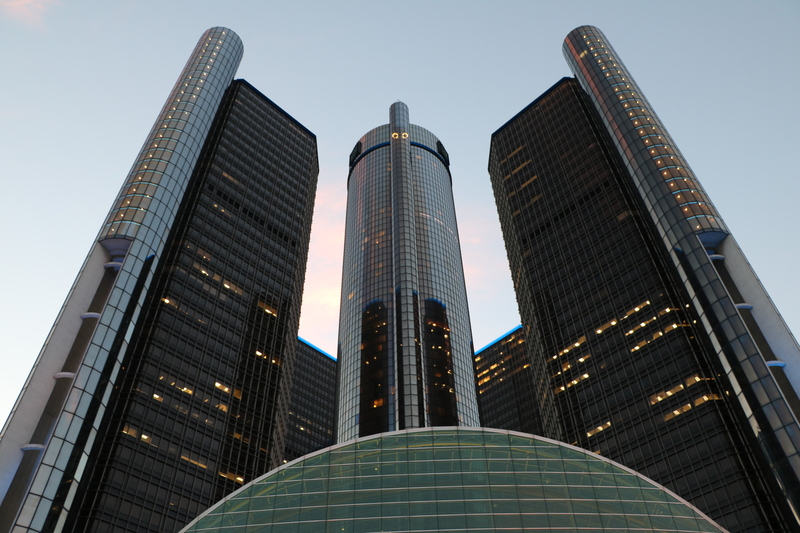 We ate dinner at a restaurant inside the General Motor Renaissance Center which is right across from the riverfront walkway. 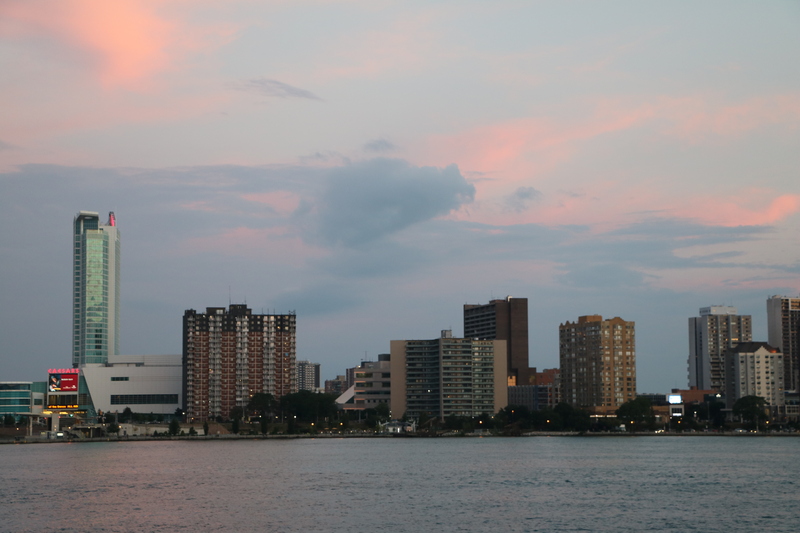 The city of Windsor, Ontario is right across the Detroit River and it looked so close. 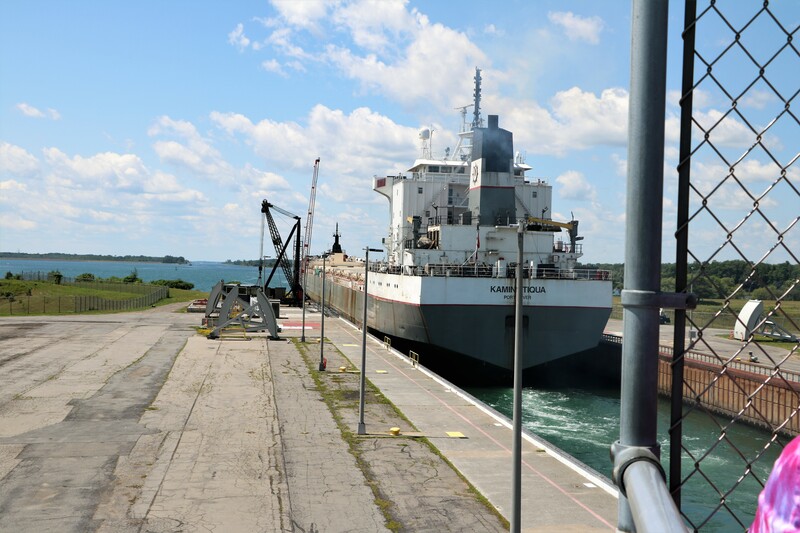 The next day we headed north to Port Huron and entered into Canada. We went east past Toronto (worst traffic ever, even though we were on a major highway – 401 – and it was seven o’clock at night) and stopped for the night in a Walmart. Then we headed east again. We kept going into Quebec and didn’t enter back in the US until Salaberry-de-Valleyfield which is not too far west of Montreal. We realized later that we passed at least a couple of border crossings such as Massena, New York and Cornwall, Canada. Gotta love GPS, but I did enjoy seeing all the signs in French and some really beautiful cottages along the St. Lawrence Seaway. We finally made it to Potsdam, New York where we parked on the property of our Florida friends Ed and Ruby. 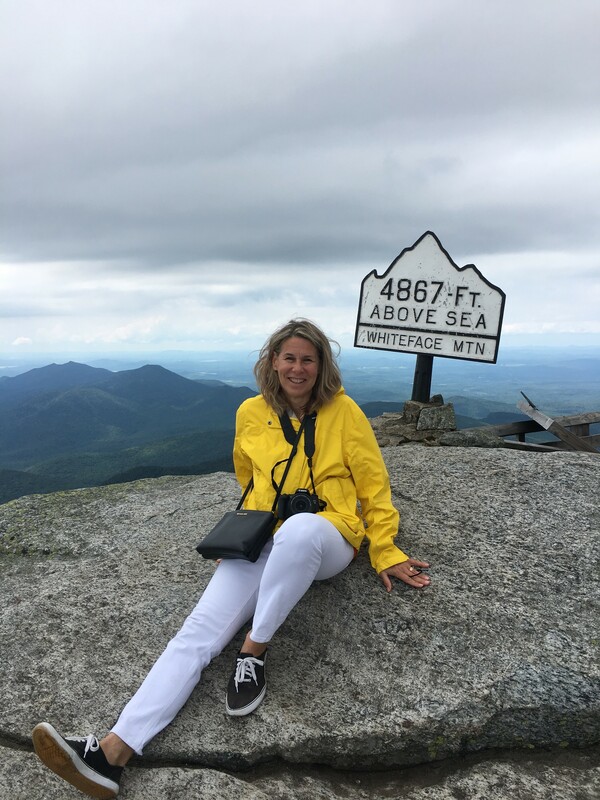 Upstate New York reminded me of upper Michigan – in fact both are around the 45th parallel which is half way between the North Pole and the equator – except New York has the beautiful mountain views of the Adirondacks. We spent an afternoon hiking the small roadside trails that led to the different Waterfalls of Tooley Pond Road in a nearby town, DeGrasse. 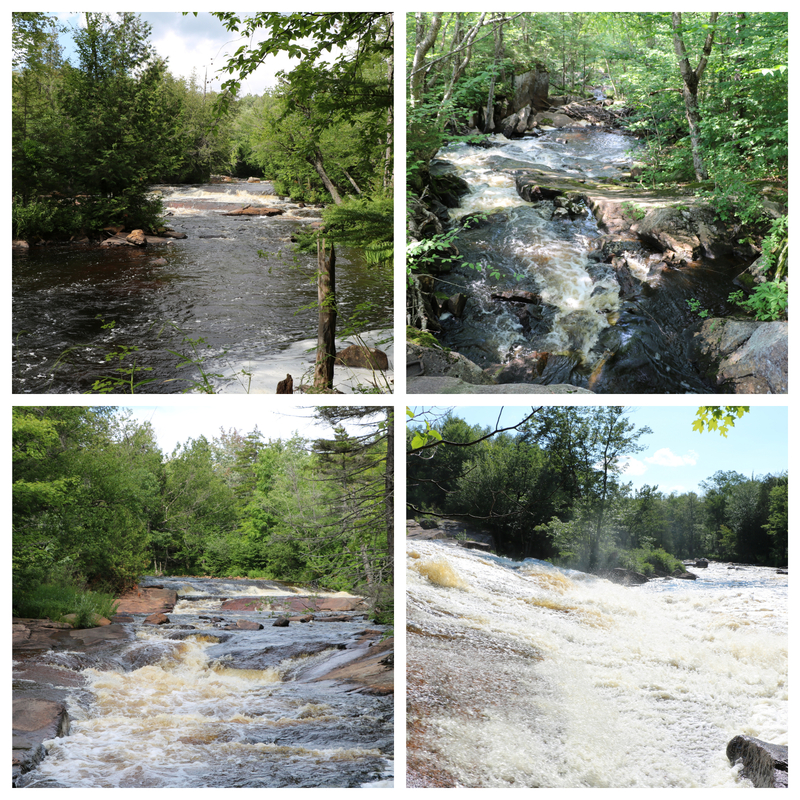 We didn’t see all seven of the falls, but each of the ones we did see had their own distinct qualities. 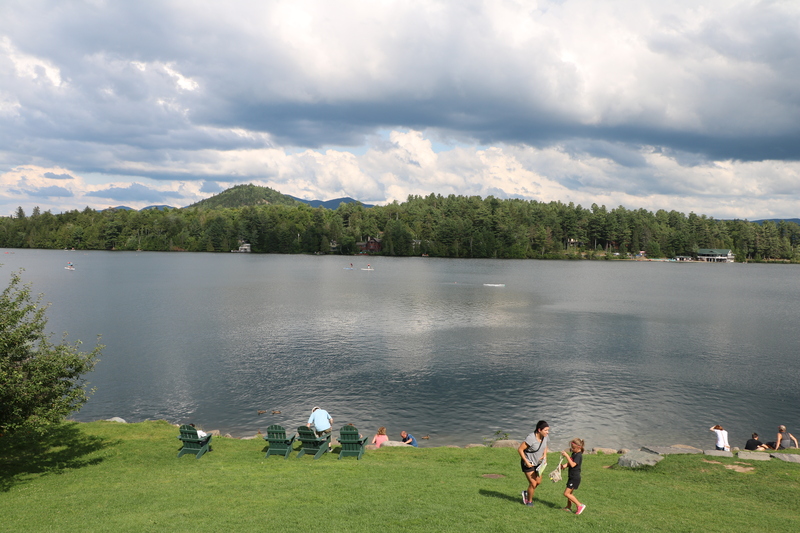 The quaint town of Lake Placid is just a bit southeast of Potsdam. It was the location of the 1932 and 1980 Winter Olympics and a lot of the buildings are still there including a huge ice skating facility. The funny thing is that Mirror Lake is right in the middle of the village and the actual Lake Placid is outside of town. 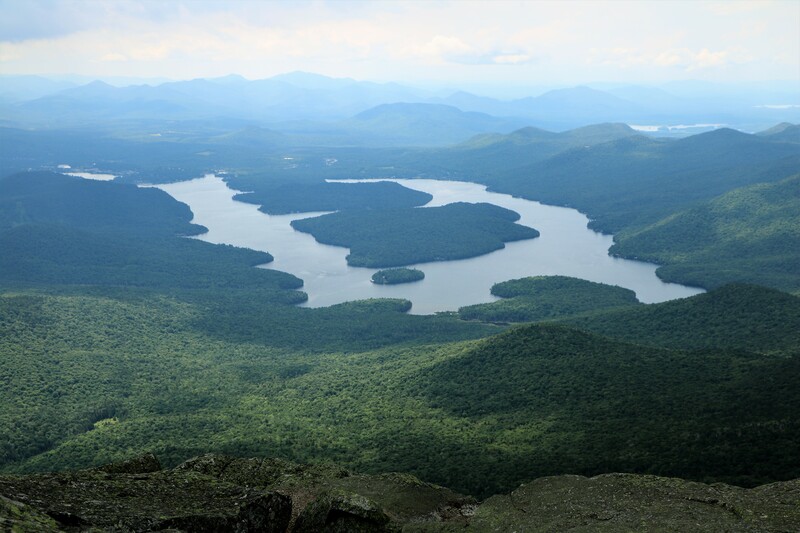 This is how Lake Placid looks from the top of Whiteface mountain which is in the town of Wilmington just north of Lake Placid the town. 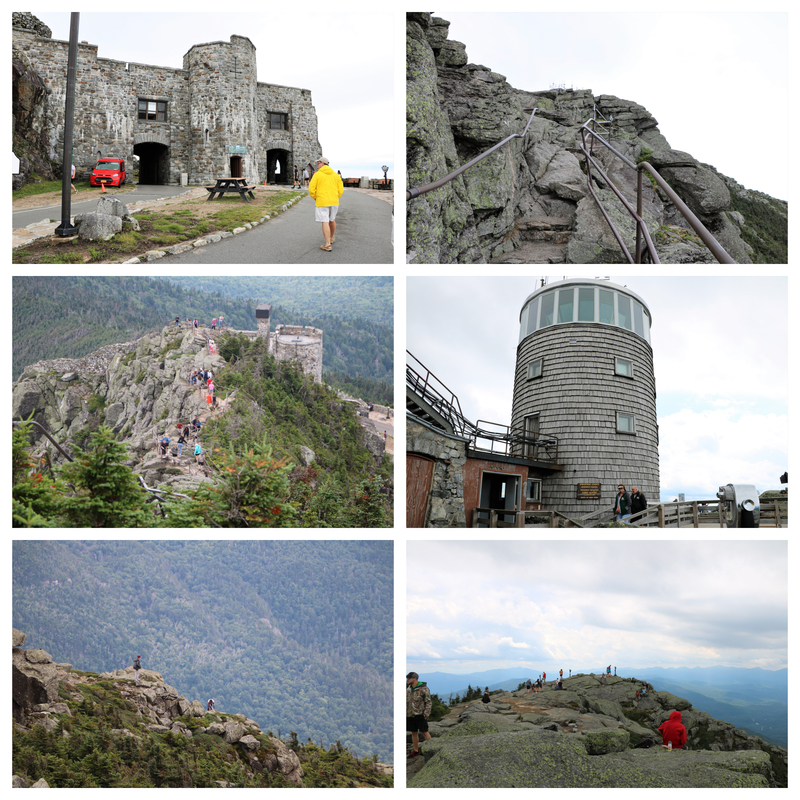 A road (fee charged) leads up to almost the top of Whiteface Mountain . Where the views are spectacular. I elected to walk up the steep, rocky slope another 257 feet to reach the highest point. There were handrails but the rock was slippery and it was slow going. I was wearing the wrong kind of shoes and some with more tread would have really helped on my way down. Definitely worth it though! At the base of the final climb, there is a “castle” that has a coffee shop that serves hot chocolate among other things. It does a great business because it’s windy and chilly up at the top! The summit is the location of an atmospheric research center for the state of New York. 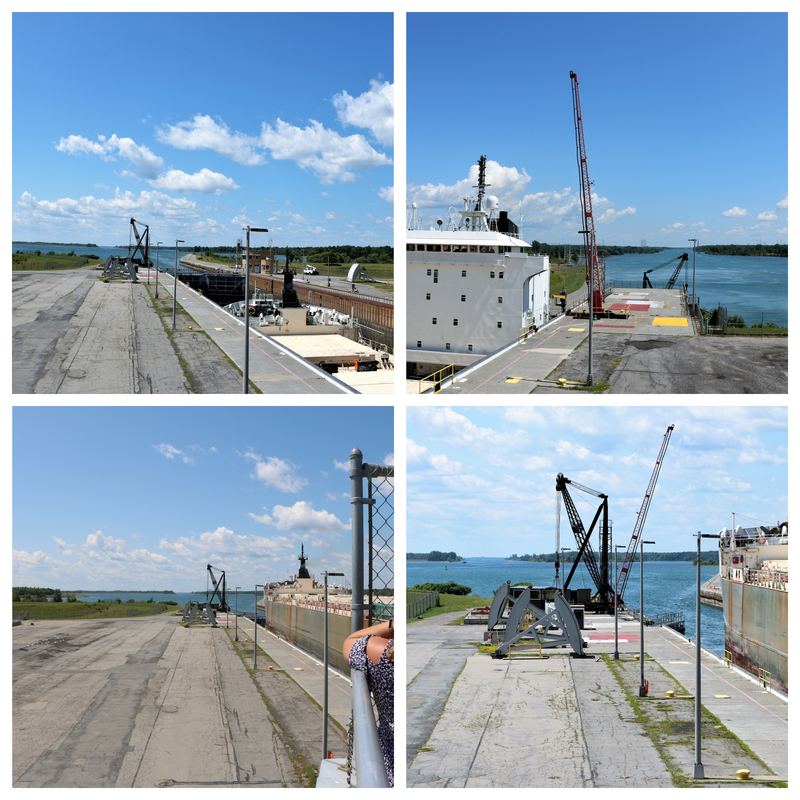 We saw a huge boat come into the lock (upper left corner, above) then the back gates closed (upper right corner, above) and it started filling up with water (lower left corner, above). Finally the front gates opened (lower right corner, above) and off it went. 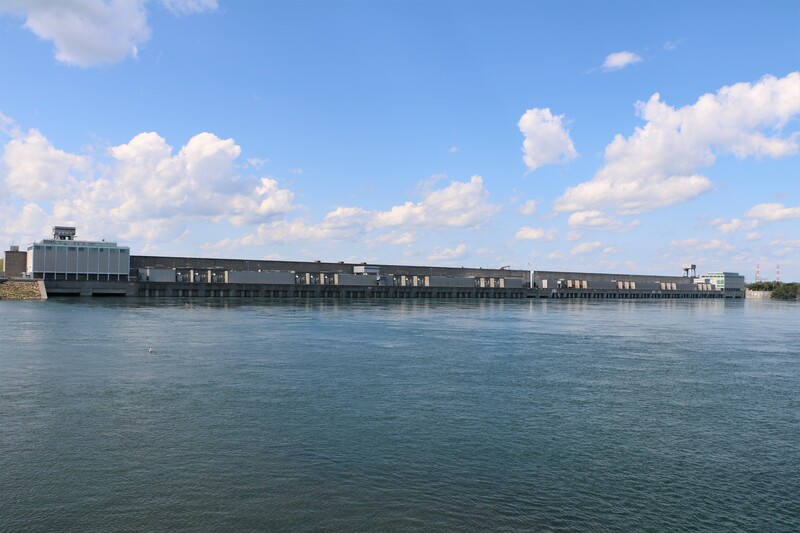 Very near by was the St. Lawrence Robert Moses Power Dam . It spans the US border on the left to the Canadian border on the right. 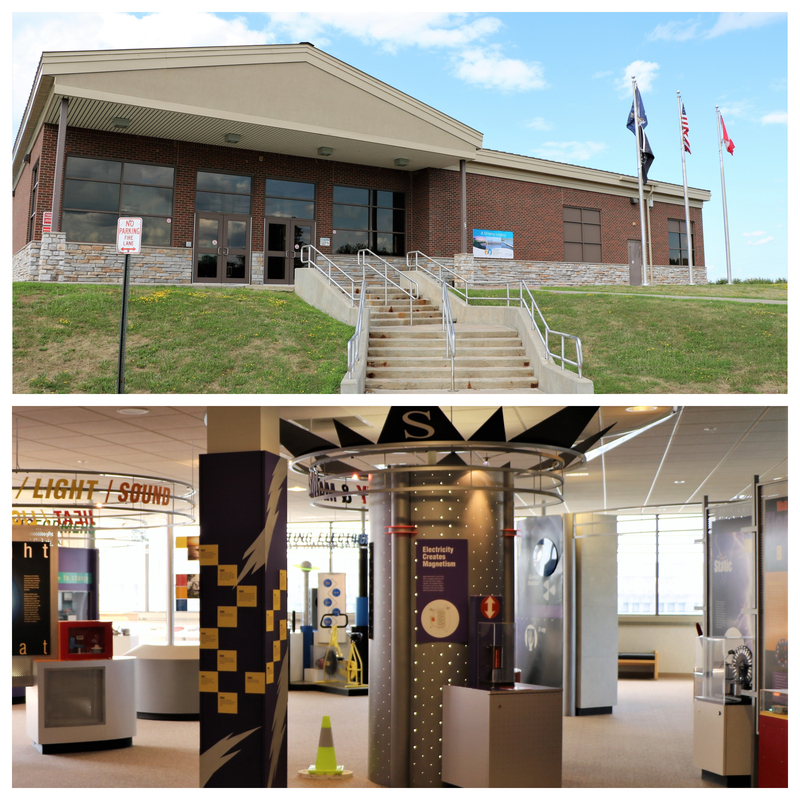 It had a Visitors Center with a very well done and informative exhibit about the dam and electricity. Then we had to say goodbye to Ed and Ruby and go south to a Cummins Engine dealer in Albany, New York to take care of a “check engine” light that appeared. After that little issue was taken care of, it was time to drive east through Vermont and New Hampshire to see the sights of Bangor, Maine.